The Chevrolet Silverado 1500 interior features a large cabin fully equipped for any Lakeland adventure, with technology like the Chevrolet MyLink touch screen. 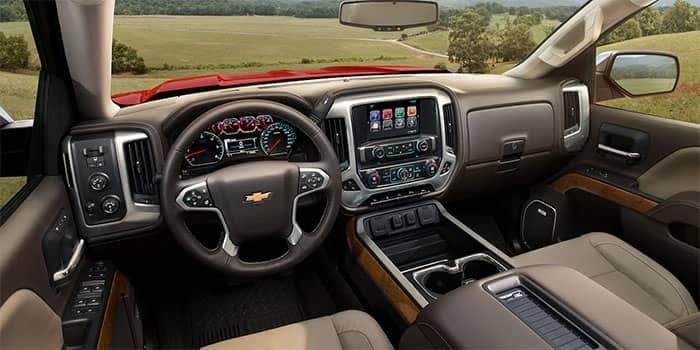 The Silverado interior is more than you expect from a truck–explore the features below, then see the interior for yourself in a new Chevrolet Silverado 1500 for sale at Chevrolet Center in Winter Haven. This 7-inch color touch-screen allows you to make phone calls, access playlists, and get information you need while driving. In the 76 cubic feet of cab space, you’ll enjoy side 45.27 inches of legroom up front, and a 60/40 flip-up/fold-flat rear-seat for additional space, to fit more of what you need. Every vehicle has a blind spot. That’s why we’ve added a Blind Spot Monitor to ensure you a safer drive. This feature senses when a vehicle is approaching a Silverado blind spot and alerts the driver. Also added to the Silverado 1500 interior is a safety suite that includes features like the Autonomous Emergency Braking, Forward-Collision Warning, and Lane-Departure Warning to name a few. Now with bigger dimensions, more technology, and added safety features that add to the overall performance, the Silverado 1500 is a great option for Lake Wales drivers in need of a new truck. Compare the Silverado 1500 vs. the Ford F-150 and the Toyota Tundra to really understand the differences that make the Silverado 1500 stand out in the lineup. *MyLink functionality varies by model. Full functionality requires compatible Bluetooth and smartphone, and USB connectivity for some devices.